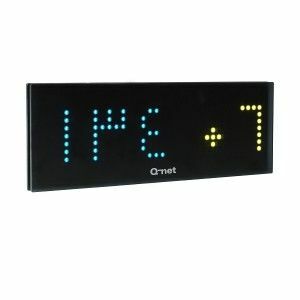 DB15 - Counter display - Q-net International Ltd. The display consists of five digits (50 mm, 5 x 7 dot matrix); their colour is bright white, but it can be covered with colour foil (blue, red, green etc..) to create an extra light effect. The DB15 display can swap between Arabic and English numbers, the swapping time can be adjusted in the Q-net Pro software. The DB15 display is available for Q-net Basic, Basic Plus and Pro systems. This unit can be connected directly to USB host, or it can be driven through OE07 6/6 – USB converter to connect it with the RS485 serial line that Q-net is using. This entry was posted in Basic, Basic Plus, Basic Plus Counter Displays, Basic Waiting Area Displays, Counter Displays, Hardware, Pro Counter Displays, Queue Management Systems, Solutions. Bookmark the permalink.